Would you pay an extra, say, $35 a year for sidewalks to be plowed after it snows? It’s a question being asked by northern cities taking the responsibility for making sure that commercial districts and residential neighborhoods remain walkable throughout the winter months. Largely because of budget shortfalls many communities, Hamtramck among others, cannot afford to clear sidewalks for pedestrians. In a recent story in online magazine CityLab, it was reported that Rochester, New York plows sidewalks when snow totals are four inches and above. In the direct path of lake-effect weather that blows in from Lake Ontario, that city pays for removal through an ’embellishment fee’ on property-tax bills, averaging $35 per homestead. The article went on to say that Duluth, Minnesota clears 100 miles of priority sidewalk routes, including routes to schools, high-pedestrian traffic locations, and public-transit locations. Bloomington, Minnesota clears all of its 250 miles of sidewalks. The story suggests that these cities’ programs could act as templates for others to formulate a plan for safe pedestrian paths in the winter. But few do, encouraging home and business owners to take care of sidewalks in front of their properties – and ticketing and fining those that don’t. Hamtramck uses contractors to plow streets for motorists. The work begins soon after snow begins to accumulate and results have been positive. They do a good job, often working through the night. No problem there. But after two recent snow accumulations in January, each roughly 4-5 inches, the sidewalks in most neighborhoods were impassable for days. 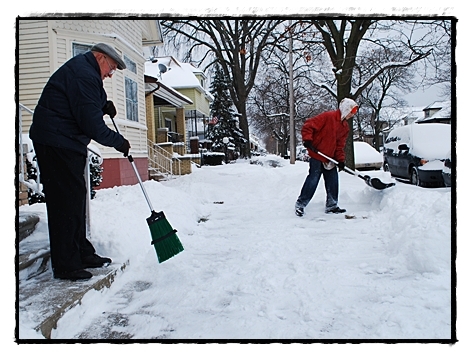 Some people shoveled or brought out snowblowers and carved out paths in front of their properties. They surely deserve a tip of the cap from all of us. But as I walked around the city on one of those days I found too many of the sidewalks in front of houses, vacant lots and even those directly in front of buildings on Jos. Campau, Caniff and Conant — the three main commercial arteries in the city — packed with snow and later ice after the region experienced below zero temperatures. My walk was a series of zigs and zags from a few cleared sidewalks to cleared streets, where I had to share the road with cars and trucks – a dangerous option for any pedestrian. I’m an experienced urban walker. After more than half a century of residency in Hamtramck I know these streets, sidewalks and alleys like the back of my hand. Luckily, I am relatively fit with no health concerns to prevent me from walking to my destinations, or to stroll for fun or exercise. Even then I am no match for a heavy machine on wheels, especially one going at a high speed. But what if I were disabled, even temporarily, or more permanently handicapped? What if I needed to do my shopping using a walker or wheelchair? Or if I were a young mother pushing her baby in a stroller? There are plenty of young women in my neighborhood doing that nearly every day. But even something as commonplace as that is impossible on snowy or icy sidewalks. In that same CityLab article the writer, who is from Kalamazoo, said a pregnant woman was hit by a motorist after being forced to walk in the street in that west Michigan city. The sidewalk where she was supposed to walk was covered in snow. She was just grazed, so presumably the injury was not serious. That could happen here, on Gallagher or Brombach, on Mackay or Lumpkin, to kids walking to and from school. Being grazed when walking in the street is bad enough, but chances are it could be far worse in a densely populated community like ours. In Syracuse, New York, a yearlong pilot program was launched this winter to plow 20 miles of “priority sidewalks” — determined by using data that showed areas of highest pedestrian usage — after each snowfall of three inches or more. The program was initiated by community activists and implemented by a city administration that listened to them and took action. The money (approximately $170,000) came from an existing public works budget, no “embellishment fees” were needed. But to sustain a program like this, there is no doubt that new streams of money will need to be found. So how does Hamtramck, with its limited financial resources, do something like this on sidewalks stretching across its two square miles? Maybe it starts with Jos. Campau and becomes a project initiated by the Downtown Development Authority (DDA). That strip from Denton to Carpenter could be our pilot program, extending a message of welcome and hospitality to shoppers and other visitors. It would make a good companion plan to the Joe Louis Greenway, the bicycle lane scheduled for construction on the length of Jos. Campau in the spring. But the neighborhoods need to be walkable for the people who live here, too. Pedestrian activity in a place that wants to be, or sell itself as, one of the most walkable communities in the state cannot be seasonal. It must be year-round and 24/7. First by buying into the idea that the public streets and walkways of Hamtramck are in fact ours. Let’s not forget what “public” means: it’s sharing and contributing to the geographic space in which we live, work or visit. It means all of us are in this together. Public life is ours to shape and govern, now and later. That’s as real as it gets. All of us are owners of the way we move and navigate through the city. If we want to walk on winter sidewalks cleared of snow and ice, we must imagine, demand and create solutions. Will we invest in our future by paying more for a better quality of life, not only for ourselves and our families or for the sake of our own properties? Will we put our heads together and find solutions that benefit everyone in Hamtramck, using models of success in other, also cash-strapped, cities? Hamtramck native Walter Wasacz writes a walkable discovery column twice monthly for The Review.